We recently completed a multi-million dollar refurbishment and upgrade to the all-suite, all-balcony ship Seven Seas Mariner. The renovated ship sailed from Monte Carlo yesterday and will call the Mediterranean home for the remainder of the season. The ship’s Grand, Master, Mariner, Seven Seas, Horizons and Penthouse Suites received all-new furniture, upholstery, lighting and wall coverings to exude Park Avenue elegance. The ship’s two-deck high, state-of-the-art show theatre was renovated and will feature our largest and most ambitious production to date. Titled “Cirque Rock ‘n Roll” this stunning spectacle is filled with aerial theatrics choreographed to music from Michael Jackson, Pink, Queen and more. The Stars Lounge features a dramatic new décor and ambiance. A new stone-topped bar anchors the room and the décor of plum, smoky-grey, gold, black and cream creates a subdued yet elegant atmosphere. The Horizon Lounge received a distinctive new stone-fronted bar, chic new furnishings, tony carpeting, lustrous wall coverings, and new lighting. While the Mariner Lounge was reconfigured with a spacious “open” floor plan and features a new bar, new stone flooring, lamps and tables. The Observation Lounge sports a stunning new décor of rich ivory, ebony and wine tones. A dramatic new back-lit bar serves as the room’s centerpiece which offers sweeping 270 degree views. The Canyon Ranch Spa received new steam rooms, new stone flooring in the reception area, refurbished changing rooms and the Fitness Center was equipped with brand new state-of-the-art exercise equipment. The Pool Deck, as well as the ship’s outdoor relaxation areas were furnished with brand new resort-style sofas, chairs, and loungers. The Pool Grill and La Veranda also received eye-catching upgrades with new mosaic tiling, new wall coverings draperies, lighting and awnings. 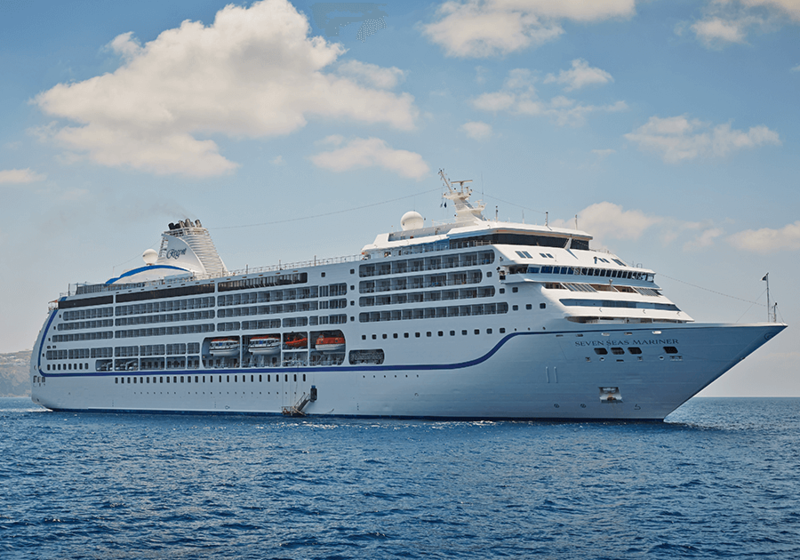 This report was prepared by Regent Seven Seas Cruises on April 8, 2014. The views expressed as solely those of the author and not necessarily those of WWTCA.